Well, here it is: my own personal quarter of an organic cow, portioned up and headed for the freezer. Now, Bossy (as I've come to call him or her) was a real lightweight, coming in at 516 lbs of useable meat (of which we recieved 129.) For your reference, Bossy cost $365, including $75 for butchering and, sadly, I have no idea where she came from, as this was all arranged by a friend (though if you're interested, PM me and I'll find out.) I could tell she was a lightweight, as I was gifted with the odd bits: tongue, of course, which was closer in size to a veal tongue than I'm used to. Not surprisingly, she came with fewer steaks than I'd have preferred, the majority of what you're seeing there are braising cuts: chuck, round, shoulder, etc. 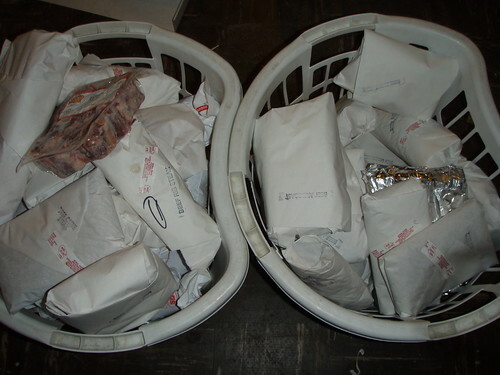 (the clear cryovac package is oxtail) Those are two large-sized laundry baskets, for reference, each probably 1.5 bushel. All told, though, she worked out to less than $3/lb, not too bad even for cheap cuts of quality beef. Apparently, if not eloquent, Bossy was a social drinker, as I got (as my quarter, mind you) a solid 3 lbs or more of liver - I know you've all seen me eat my way through cow offal, but oddly, I'm not a fan of beef liver - suggestions are welcome. (Sausages?) I was also gifted with the heart, as the only cook willing to deal - and several "meaty soup bones." We got quite a few 1-lb bags of hamburger meat whose origins remain a mystery (fine with me) We dug in a bit this weekend, and I cooked up some minestrone with a beef stock from one of the soup bones, and a meat lasagna with a pound of the ground beef. Both were remarkably flavorful and lean; the ground beef was a good bit dryer than I'm used to, which meant it browned nicely when sauteed. 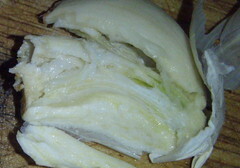 The meat from the soup bone retained its flavor even after being cooked all day to extract the broth. 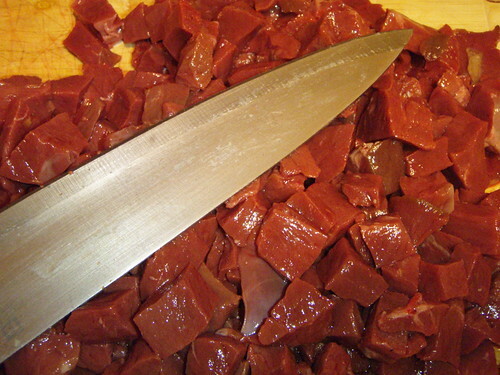 Edited to add: This thread contains photos of raw beef offal. Last edited by Mhays on February 16th, 2008, 9:08 am, edited 1 time in total. Very interesting indeed. I've been hearing more and more of cow splitting, and have had a few offers to go in on one. Question: Are you able to select what "grade" (select, choice) of cow you'd like butchered? Another question: what's a "guestimate" of how many pounds of the less collagen, quick cooking, non braising cuts you netted? Sorry, I don't really know of a term to describe - I'm talking about steaks that could be considered as higher grade like ribeye / sirloin / skirt / strip etc. I don't really consider them higher grade as much as I consider them "easier to cook." One time I split a beef 3 ways and volunteered to take all the liver....that's a whole lot of liver. Within a few days or weeks, I hope to document this Christmas' batch of calf lever pate - or at least the Swedish version that is spreadable and served as a sandwich condiment. I personally would use at least a little of that wonderful liver of yours, Mhays, in something like a the Swedish "Kalvlever Anglais" (flash pan-fried and served with crispy bacon, capers and mashed potatoes) - it may just change your opinion. However, a pate-like preparation may just tone down the liver-bite enough to suit you a little better. I love the taste of liver but can get a little sensitive to its texture - expecially if it is overcooked. Pate gets around that issue. I'll put a link into this post when and if I get a passable post put together about my liver pate this year! One way or another, I'd love to see some posts/photos of what all of that incredible beef ends up as. Seebee, my input into the matter was to nod when asked, all I specified was a Christmas rib roast (which did cut into my steaks considerably.) It could be choice for all I know, but it's markedly more flavorful than grocery-store meat thus far. However, the braising-cut to grilling-cut ratio is pretty high - I think out of all that meat, a single bottom layer in the laundry baskets were 1" thick rib, t-bone and sirloin steaks - a good primer on why that meat is so expensive. It isn't a good way to go if you're looking exclusively or mostly for steaks. I really, really liked the hamburger, which was very lean and tasted strongly of cow. I split a 1/4 of a cow recently with some friends. 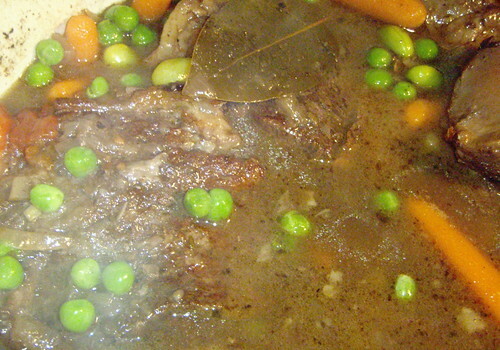 It is just the nature of the cow that you end up with more braising cuts than grilling cuts. That is why steaks cost so much more than roasts, there aren't as many per cow. When purchasing my cow, the farmer called me up and asked how I would like it cut up. I chose to get every cut of meat that I could, instead of turning things into hamburger or "stew" meat. However I love slow cooked beef so this has worked out well for me. Mhays wrote: Apparently, if not eloquent, Bossy was a social drinker, as I got (as my quarter, mind you) a solid 3 lbs or more of liver - I know you've all seen me eat my way through cow offal, but oddly, I'm not a fan of beef liver - suggestions are welcome. 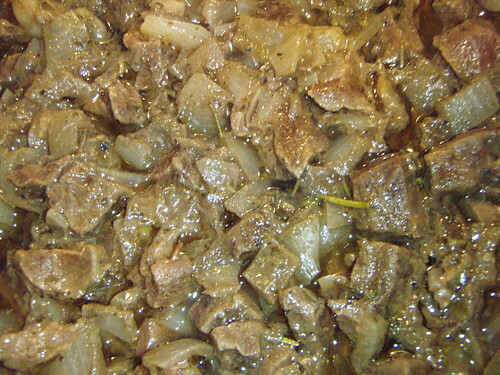 Beef liver makes excellent Jewish-style chopped liver. That's all my bubbe ever used. Broil till very well done (more well-done than anyone would want to eat by itself, almost leathery) and combine with schmaltz, onions, hard-boiled eggs, etc. Also gribenes, if you have any. I finally made a postabout making a liver pate-type preparation with veal/beef liver. Don't know if you're still interested but I did promise to let you know when/if I got the post made. Looking for something else, I stumbled across this post and realized I haven't been updating it. My liver terrine went over pretty well, nice to add it to the cheese tray that came out over the holidays. Next up, chopped liver and Leverpastej! Just made my first oxtail stew, and, boy - now I understand why those things are so expensive! Kind of like chicken feet in the gelatin-y velvet mouthfeel the sauce, but with serious beefy flavor. Unfortunately, one cow's worth of oxtail wasn't really enough for even 3 people, so I rounded it out with a "meaty soup bone" (sic) which rendered lovely medula, (marrow) making me wish I knew what happened to the legs of this critter. Of course, we wound up with leftovers. A Firehouse find - the 'spouse told me they had pot-roast over spaghetti squash one night. I tried this with the leftover oxtail/soup bone stew and it was absolutely excellent! Lighter than noodles or mashed potatoes - in a good way. Even Sparky, who loathes vegetables in the orangey-yellow spectrum, snarfed it down. Last night's foray into cow was 7-bone Chuck roast braised in wine over polenta. Family loved it - I thought it was OK. Unlike the rest of the cow, this didn't strike me as being that different from grocery-store chuck steak - but I can't say if that was preparation or the meat itself. Well, Bossy did herself proud again. 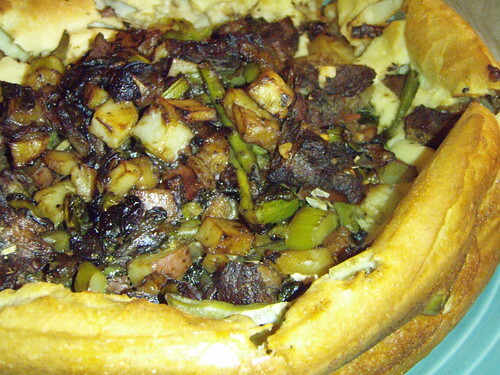 It was, indeed, better than the original dish - of course, other than the Yorkshire Pudding part I didn't follow the recipe at all; mine had potatoes, onion, pot roast, gravy and Yu Choy...but the basic idea was the same. Family snarfed every bit. It was one animal split 4 ways between 4 families: we got some of almost everything; seems like quite a bit was ground into hamburger because we didn't seem to get belly cuts (I also didn't get any marrow bones or brains, but I forgot to ask the butcher) It was butchered, frozen, delivered together and we split it into coolers and laundry baskets and took our portion home. I did document some of what we got above. Sear meat seasoned with salt and pepper in a few tablespoons of oil that's been preheated in a skillet. Don't touch it for a few minutes and it will brown nicely, turn until seared on all sides. 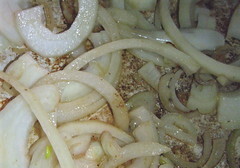 Remove the meat from the pan, add a sliced onion and turn the heat way down. When that has become translucent, smash 3-4 cloves of garlic, remove the paper and throw them in whole. Stir thoroughly, and when the flour seems incorporated into the fat at the bottom of the pan, add two bay leaves, 1/2 tsp of salt and seasonings of your choice (I used Herbes de Provence and some peppercorns) and put the meat back in the pan. Pour in about a half bottle of red wine, and then add enough chicken stock to cover the meat. Cover and put in the oven at 250 degrees for 3 hours. 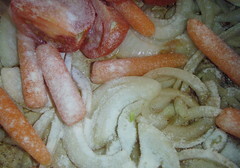 Bring it back to the stovetop, add 1 cup of frozen peas or frozen edamame and 1 snack-size bag of raw baby carrots, chopped. Simmer uncovered on the stove until the carrots reach the desired tenderness, test for seasoning and serve over big schloopy noodles. out of curiosity where was that beef processed? often you really have to spell out how you want it cut up. they'll make everything into hamburger. i learned that the hard way. "where's the flank steak, where's the skirt steak, etc." Sorg's is a large packing house about 85 miles NW of Chicago (or 15 miles north of Harvard, IL). They also have a retail store and make some pretty good sausages. Skirts and flanks will generally be ground into hamburger as quite frankly, few people are familiar with them. However, the customer is the boss and they will cut to YOUR specifications if you tell them what you want. Do realize that there are 8# of skirt steaks and 4# of flank steaks out of 750# of carcass weight. Personally, I am not really excited about buying a whole or portion of a steer as you have so much bone and scraps that you are paying for. In the long run, i would rather buy the cuts I want. I'm not sure how you purchased it, but someone had to give the processor a cut sheet, explaining how they wanted it cut up. Your goal should be to be the one that fills out that sheet. Maybe you can head up a group of friends next time and take charge. then make sure you get the good stuff like the tongue in exchange for giving them more burger. that kind of thing. make it sound like you are sacrificing. Right - but not wanting to look a gift cow in the mouth, I left that to the ones who actually did the purchasing. That being said, I'm still pretty happy and plan to do it again - FWIW, jlawrence, I think I came out ahead overall if you average in the expensive meat with the cheap and discards. It's possible that your quadrant purchased did not contain skirt or flank. Our experience with our 1/2 cow is similiar in the sense that the rural processor is not exactly Loebels when it came to cutting the steak. They have their standard cut sheet and that's what they use. I worked with my guy to get a little customization, but there's only so much to do. Mhays wrote: Right - but not wanting to look a gift cow in the mouth, I left that to the ones who actually did the purchasing. That being said, I'm still pretty happy and plan to do it again - FWIW, jlawrence, I think I came out ahead overall if you average in the expensive meat with the cheap and discards. Don't let me discourage you. Half of my freezer is filled with beef bones and less tender cuts from people who 1) bought a side of beef and 2) are clueless as to what to do with shanks, flanks, and oxtails. Other than ground beef, their generosity has kept me well fed (g) ... at no cost. jlawrence01 wrote: Half of my freezer is filled with beef bones and less tender cuts from people who 1) bought a side of beef and 2) are clueless as to what to do with shanks, flanks, and oxtails. Other than ground beef, their generosity has kept me well fed (g) ... at no cost. Obviously, a cheaper option is to be friends with your friends! This seemed like a good idea on all counts: satisfied my need to eat the grisly bits, and my hubby's need for meat-and-potatoes. 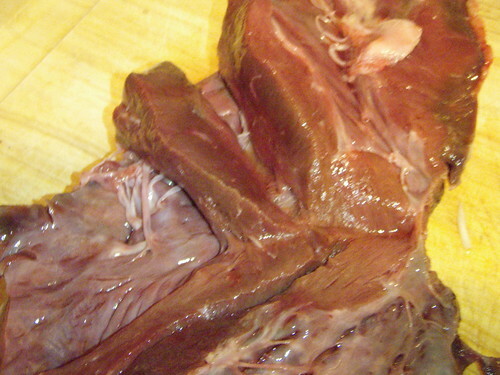 Interestingly, the meat was most remeniscent of...well, chicken hearts! I liked it quite a bit (being the one who snags the heart from the giblets whenever I can) It's chewy but very even-textured: not at all gristly, and not very strongly flavored. 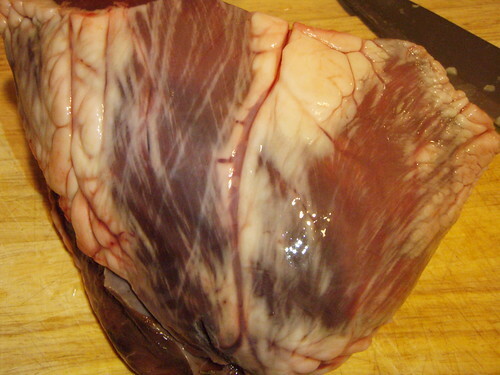 It's a bit beefier than chicken heart, but tastes more like meat than offal. I did quite like this preparation (though my mashed potatoes failed, as usual - but at least this time they were too fluffy) Future beef heart preps will, I think, be some kind of pot-pie with a similar filling but more veg. and braise in 350 degree oven for 45 minutes. Top with mashed potatoes, swiss cheese, panko and ground hazelnuts (I'll omit the nuts next time) and cook for another 10 minutes. Last edited by Mhays on March 1st, 2008, 7:46 am, edited 1 time in total. Thought it was a great idea when you mentioned it the other day. Glad to see it worked out in reality. jlawrence01 wrote: Skirts and flanks will generally be ground into hamburger as quite frankly, few people are familiar with them. Vital Information wrote: Thought it was a great idea when you mentioned it the other day. Glad to see it worked out in reality. Been meaning to ask you - how did you use the beef suet? I think of bricks for bird feeders, mostly - I guess some meat pastries use it, too, but it's not something that's right out there. The plan for the suet is steak and kidney pie (with the kidneys from the cow); + some to MikeG. C'mon, Seebee, realize that most people use perhaps ten cuts of beef, period. 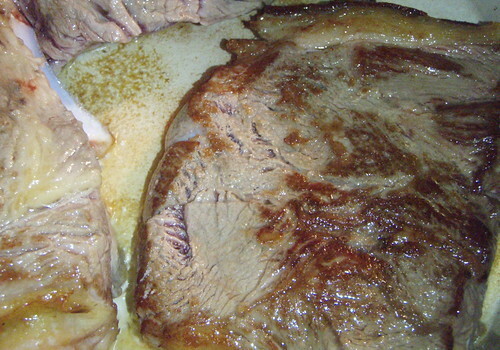 In general, they have NO clue as to how to cook the "less tender" cuts of the steer. That is why places like Jewel get away with some of the blatant mislabeling (bottom round is NOT London Broil). Outside of Chicago and certain ethnic areas, you generally NEVER see a skirt steak. Outside of LA, you RARELY see a tri-tip (other than the recent introduction by Costco and Trader Joe's). When you are butchering your OWN steer, you know that you are getting everything including the hoofs, hydes, and the other parts. I'm as big a fan of skirt steak as anyone, and I'll even step up to defend the virtue of grinding it up from time to time. 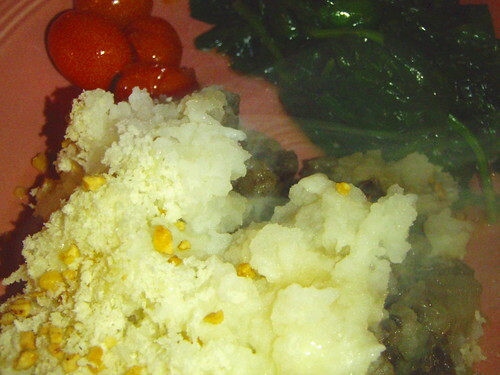 It lends a lot of good beef flavor to dishes that call for ground beef. It's really not such a bad thing. I was introduced to this concept from Lynne Rosetto-Kaspar's recipe for Ragu Bolognese which calls for a portion of ground flank or skirt steak. I find it far superior to using ground chuck or round in a lot of cases.